A perfect companion for the frequently-used kitchen, the convenient pull-out spray on the KWC ONO Highflex™ is easily operated and immediately returns to its original position after use. 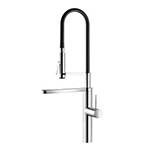 The ergonomic spray and flat spout can swivel 360 degrees, facilitating a wide range of activities at the sink.With its two-stage operating system, the wear-resistant, flat-topped spout produces a low pressure stream that automatically switches to a more powerful stream for extra cleaning power. When the spray lever is pressed down completely, it operates in the pressurized spray position.